Two test cells with two types of scintillator liquids have been shipped from the Netherlands to South Africa in the middle of January. The test-cell housing has been manufactured by Scionix B.V., Bunnik, NL, and the filling was placed in the cells by Eljen, Texas, USA. 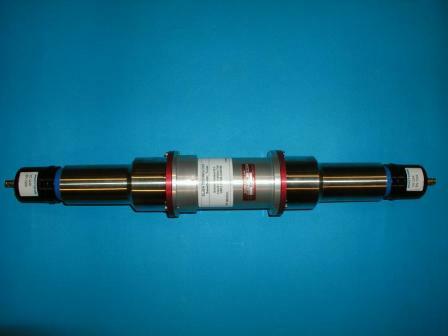 The two photomultiplier tubes were provided by Photonis as a contribution in kind to the EARTH project. The figure shows the two 3” PMTs, with their mu-metal shielding and the voltage divider. In the middle of the picture one notices the 10cm long, 7.5 cm diameter, cylindrical test cell. At iThemba LABS, near Cape Town, the detectors will be compared on their properties for antineutrino detection. Based on the outcome of these experiments a choice will be made on the most suitable liquid to fill the GiZA detector. The construction of the test cells and the mechanical design of GiZA are part of a plausibility study in the framework of the programme of Stichting Sensor Universe, Assen, NL. The mechanical design of GiZA, also worked on by Scionix is nearly completed. Soon we hope to send out bids for the construction. A design for the background veto counter is being studied and will soon be ordered..